What is with male Indian doctors and writing? Abraham Verghese, Atul Gawande, Siddhartha Mukherjee, Sandeep Jauhar and now Dr. Sanjay Gupta... though one has to admit that Dr. Gupta is definitely multitalented. A question that is raised by many is whether his books would have been successful if he was not such a big media personality.. Not to mention the constant harping by the likes of Wolf Blitzer about Dr. Gupta's debut fiction book Monday Mornings. The book was published almost a month ago and till date CNN's bottom news roll has a mention of this book once every couple of minutes about it being a NYT bestseller. So the big question here is -- Did the book sell the author or did this authors powerful media personality and connections sell the book? Here is a link to Chapter 1of Monday Mornings from CNN. A very good article about Sanjay Gupta in USA Today can be found here. Text below. 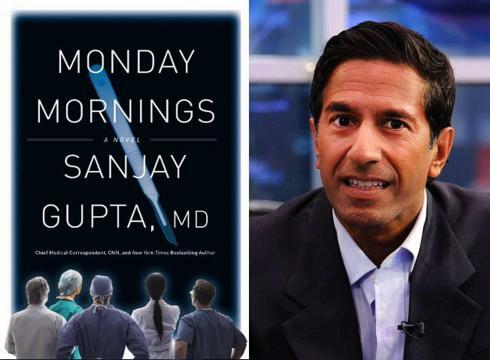 ATLANTA – It's Monday morning and Sanjay Gupta is in surgery on the sixth floor ofGrady Memorial Hospital. The operating room is quiet except for the sucking, gurgling sounds associated with surgery, along with some background music requested by one of the residents. Let the Good Times Roll by The Cars blends into the Talking Heads' Take Me to the River, all while blood silently flows through tubes attached to the patient, a 24-year-old man who broke his neck in a car accident the night before. Standing on two orange risers with an overhead spotlight beaming down onto his hands, Gupta and his team are decompressing the man's spinal cord as quickly as possible, pulling his neck into alignment and then fusing it back together. An assistant repeatedly wipes blood from the surgical instruments Gupta hands back, a process that quickly turns the white cloth pink. Two and a half hours later, Gupta's team declares the surgery a success. Raised: In Novi, Mich., suburban Detroit. His parents moved from India to work as engineers for Ford Motor Company in the 1960s. Education: B.S. in biomedical sciences at University of Michigan; M.D. from University of Michigan Medical School, 1993. Completed his residency in neurosugery at the University of Michigan Health System in 2000. Family: Married wife, Rebecca, an attorney, in a lavish day-long Hindu ceremony in 2004. They have three daughters, ages 6, 5 and 2, and live in Atlanta. Television: Joined CNN in 2001 as chief medical correspondent. Special correspondent for CBS News and 60 Minutes. Other experience: Served as one of 15 White House Fellows, primarily as an advisor to Hillary Clinton in 1997-1998. In 2009 offered the position of Surgeon General by President Obama, but withdrew his name from consideration, citing family and career. Books: Two non-fiction titles, Chasing Life(anti-aging advice, 2008) and Cheating Death(miraculous recoveries, 2010), both best sellers; and Monday Mornings, first novel, pubbing on Tuesday. "Looks good," Gupta says while looking over one final X-ray. "We have to do a little bit of gardening, but it looks good." "Trophies for everyone!" someone yells. Most Americans know Gupta as CNN's Emmy Award-winning chief medical correspondent, the one with the shiny black hair and dazzling smile, a smile that is hidden this morning behind his blue surgical mask. And yes, he's a real neurosurgeon, not just playing one on TV. He practices at Emory University Hospital and is associate chief of neurosurgery services here at Grady. He is also the author of his first novel, Monday Mornings(Grand Central, 304 pp., $24.99, on sale Tuesday), a book Gupta describes as a "peek behind the curtain" at what really happens in a hospital. There are chapters that are downright chilling, with surgeons operating on the wrong side of the brain, for instance. More on that later. Keeping up with Gupta is not for the weak of heart, or the weak of anything. Gupta, 42, operates four or fives times on any given Monday, or 200 to 250 surgeries a year on that day. He also operates every other Friday and sees patients on Thursdays. He starts making his rounds at 5:30 a.m. and rarely finishes before 8 p.m.
Then there's his gig at CNN, with frequent reporting junkets to medical emergency hot spots like Haiti (earthquake), Japan (tsunami), New Orleans (Hurricane Katrina) and Iraq (war). And don't forget his attorney wife, Rebecca, and their three daughters, all under 7. Can a breakdown be just a commercial break away? Not likely, says Gupta's CNN producer, Ben Tinker. "You won't see any meltdowns," he says. "In fact, you're not going to find anything. What you see is what you get." Immediately after surgery, Gupta is in the physicians' locker room, changing out of his scrubs and into a long white lab coat bearing his name. He also pulls up his bold green and black striped socks, just one pair from a large collection for which he is famous around the hospital and at CNN. "I have a split career," he says, "and living here makes it a lot easier than, say, in New York." In less than five minutes, he's pulling his wife's sporty Jaguar into the CNN parking lot, where, like Superman, he strips off his white coat and throws it into the car's back seat. He is now Sanjay Gupta, reporter. He says he keeps his two lives — surgeon and TV star — separate, not wearing scrubs on TV, for instance. He joined CNN in the summer of 2001, recruited by then-CNN chairman Tom Johnson. He had never worked in TV before. His first big story: reporting on the 9/11 attacks from Ground Zero. "I'm a reporter here," he says, once he's in CNN's massive newsroom. "I'm informed by my background, yes, but I'm pretty tough on myself. I make sure I've got it right. I feel good about what I do. We're diligent." Between constantly checking his iPhone — he has four e-mail accounts — and wolfing down a burrito from Moe's Southwest Grill ("they're the best"), he chats in his CNN office about his life on the run and his new book, a project he has been working on "for a long, long time." The book's title, Monday Mornings, refers to when physicians at "Chelsea General" in suburban Detroit gather for their weekly "Morbidity and Mortality" (M&M) meeting — a time to discuss and analyze what went wrong in recent surgeries, a private meeting Gupta says is held at most hospitals. That operation on the wrong side of the brain? It's discussed there. It's like going before a jury of your peers, not a fun outing for the erring physician. "It's unsettling to surgeons to realize they're not infallible. Operating on the wrong side of the head? It happens," he says, adding that no one is harder on themselves than doctors. The idea for the book came from his years as a neurosurgeon. "I write things down a lot. I take a lot of notes. And then I realized there were some unbelievable stories there," says Gupta, who also realized many of them were about the relationship between physicians and their patients. "I wanted people to understand what happens in a hospital when there's a mistake. Bad things can happen to good people." If you think this sounds like a good TV show, you're not alone. Shooting for Chelsea General, a TNT pilot based on Gupta's novel and starring Alfred Molina and Ving Rhames, begins this week. Executive producer is David E. Kelley (Boston Legal,Chicago Hope, Ally McBeal). Gupta wrote much of his debut novel on planes: "It's kind of hard to do with three kids in the house." One time the story came so fast he wrote for almost 30 hours straight. "It was all there, and I wanted to get it out." Having difficulty bringing his theme together early on, he decided to use the Monday morning meetings to bring the novel's five diverse surgeons together. He says he didn't show the novel to anyone for fear they would respond with the cliché "Keep your day job!" Early reviews show he needn't have worried. Fellow author/physician Abraham Verghese, author of Cutting for Stone, sings the book's praises on Amazon.com. "Hospitals are, after all, Gupta's turf. His insights into the craft of surgery combined with vivid storytelling make Monday Mornings a gripping and wonderful read right down to the wire." So how much is real? Deb Futter, Gutpa's editor at Grand Central Publishing, echoes Verghese, praising Gupta for the way he blends medical facts and storytelling. "Everyone is fascinated, and terrified, by what goes on behind the scenes at a hospital. Dr. Gupta's novel takes you right to the heart of the medical world," Futter says. "He manages to make the doctors real people with real problems and also marries medical information with a riveting plot." Will his fellow physicians see themselves as those "real" people in these pages? Another novel is not in the works. At the moment, Gupta is "toying around" with the idea of writing a book on memory. His two non-fiction books, Chasing Life (anti-aging advice) and Cheating Death (miraculous recoveries), were best sellers. Unlike the solitary writer's life, being on TV has brought Gupta high-profile visibility both around the world and at home here in Atlanta. He and his wife are often interrupted on the rare evening they go out to dinner. Someone usually has a medical question for the good doctor. And with that the handsome novelist/physician/father/triathlete flashes his famous smile and is off once again — back to the hospital, where at least three more surgeries await this afternoon. "There are some mornings I wake up and feel besieged," he admits. "But I'm incredibly lucky. Sometimes I have to pinch myself that I get to do all of this stuff."